Easter eggs are perfect for a non religious party. A non religious Easter celebration can be a fun way to enjoy spring, regardless of party guests' religious affiliations. While the Easter holiday is intimately connected to the story of the crucifixion and resurrection of Jesus Christ for many people, not all individuals are religious or have the same views of the holiday. Furthermore, adding religious elements into a party can make the event more solemn and reverential instead of a fun, exciting celebration. In some instances, such as school celebrations, religious-oriented parties may be frowned upon or prohibited. Fortunately, there are many ways to celebrate this spring holiday without religious connotations. Baby Animals: Bunnies, ducklings, chicks, and lambs are popular icons of spring and Easter, and a party theme embracing these innocent animals can represent the renewal of the season. Gardening: Spring is a time to plant new flowers and vegetables, and a garden party is the perfect theme to use for an Easter celebration. Flowers: As the new season blooms with brilliant colors and fresh fragrances, a flower-oriented spring party theme can celebrate Easter and nature. Butterflies: These delicate insects are like flying flowers and are a perfect symbol of Easter and spring that can be used for an overall party theme. Easter Eggs: There are many ways to incorporate different sizes and styles of Easter eggs into a party theme, from decorations to activities to treats. Decorating Eggs: Dyeing, painting, and personalizing Easter eggs is a fun craft project all ages can enjoy. 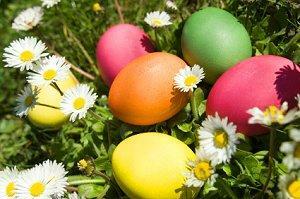 Easter Egg Hunt: Use dyed or plastic eggs for an indoor or outdoor Easter egg hunt. More obvious hiding places are perfect for youngsters, while older guests will enjoy the challenge of trickier hiding places. Fill plastic eggs with treats or toys for an added bonus, but take care to limit the number of eggs any one guest can collect so everyone can participate equally. Spring Stories: There are many children's picture books with beautiful spring stories and gorgeous artwork that can make a story time extraordinary for young guests. Bunny Hop Sack Race: Use sleeping bags or cloth sacks for this fun sack race. Add even more bunny touches by pinning tails on the sacks and requiring participants to wear bunny ears. Spring in a Pot: Planting seeds or floral seedlings in small terra cotta pots is a great activity for party guests. The pots can be decorated or plain, and when complete they serve as living party favors. Sidewalk Art Gallery: A bucket of pastel-colored chalks is all that is needed to turn an ordinary sidewalk or driveway into an Easter art gallery. Invite guests to create pictures with a spring or Easter theme, or use the letters in "Happy Easter" and have each guest decorate a different letter for a colorful greeting to passersby. Jelly Bean Jar: Fill a jar with jelly beans and give guests slips of paper to guess the total number of beans or the total of a particular color (be sure to count them first!). The winner receives a prize or may be able to take the jar home. Pin the Tail on the Bunny: This game is a variation of the familiar "Pin the Tail on the Donkey" kids' game. Other options may include pinning Easter eggs on a basket or pinning a bow on a baby animal. Egg Races: Use colored Easter eggs for guests to roll across a finish line using only a spoon or their noses. This race can also be designed as a relay, or guests may need to pass their eggs back and forth on spoons without dropping them in order to win. Hard-boiled eggs are a necessity to avoid accidental splats! Easter Scavenger Hunt: Scavenger hunts are great activities for indoor and outdoor parties. For an Easter theme, hide small colored eggs and other Easter candies, small plush bunnies, jelly beans, and spring objects such as butterflies, flowers, or feathers for participants to find. Be sure there are enough items so everyone can find one of each object on their scavenger checklist. In addition to a great theme and fun games, a non religious Easter celebration needs appropriate decorations and treats to make it a festive occasion. Party decorations are easy for Easter themes. Pictures of bunnies, chicks, ducklings, butterflies, and other spring creatures are perfect choices, and the party can also be decorated with flowers and colorful spring plants. Pastel colors such as pink, yellow, green, and blue can be used in streamers, balloons, plates, cups, and other essentials, and many party stores offer non religious Easter-themed centerpieces and other decorative items. Small Easter baskets can be filled with treats as party favors, or larger baskets can be used as serving dishes and themed decorations. A non religious Easter celebration can be a fun way to enjoy the holiday and celebrate spring. With great food, fun games, and a spring-oriented theme, party guests are sure to embrace the rejuvenation of the season no matter what their religious preferences..